The pricetag for repairs at a problematic pond in the Village of Alhambra is projected to reach nearly $90,000. 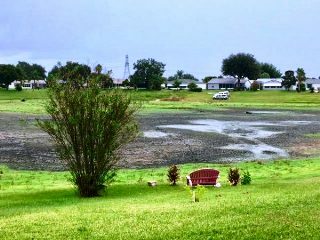 The Community Development District 2 Board of Supervisors on Friday morning reviewed a 39-page report from Andreyev Engineering Inc. regarding the most recent sinkholes that have drained Lago De Leon. The report cost $26,000. The report recommends the injection of 350 to 400 cubic yards of grout to repair the pond, which is primarily used for stormwater retention. Over the past decade, CDD 2 has spent $78,000 repairing sinkholes at that particular pond. Supervisors verified that CDD 2 has sufficient financial reserves to pay for the nearly $90,000 project. “We saved up for a rainy day and now it’s raining,” said Supervisor Bryan Lifsey. The supervisors also considered spending another $40,000 to $50,000 for additional engineering work to examine other areas of the pond not covered in the Andreyev Engineering Inc. report. “It could prevent us from sitting here a year from now and facing another $90,000 bill,” said Supervisor Barton Zoellner. Lago De Leon has been drained by a series of sinkholes in the Village of Alhambra. That idea had the support of Robert Kraus, of the Village of Santiago. “Fix it once, fix it right,” Kraus said. In other business, the CDD 2 Board approved a $1.4 million budget with a 12 percent increase in the maintenance assessment rate paid by residents.